If you’ve been looking for a tiny home you can take with you, travel with, and go on adventures with. Then you might want to consider a micro-cabin like this one. It still has that cabin look and feel. 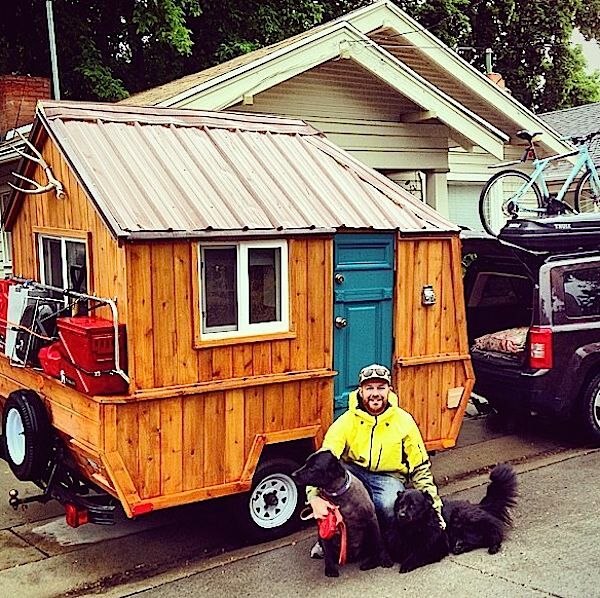 But since it’s smaller it’s just so much easier to tow and get around with than with a larger tiny house. Not only that, but it’s also a lot cheaper to tow too. But what Michael, the owner/builder, did here is very creative. 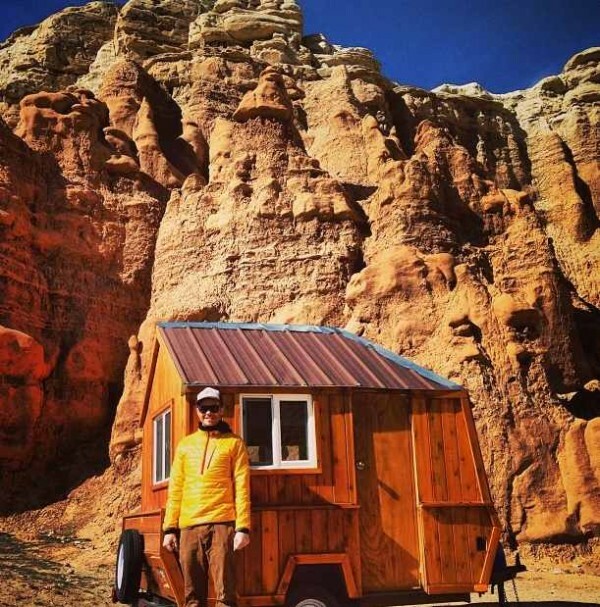 He took his older pop up camper and turned it into this amazing DIY micro cabin on wheels. See for yourself in the photos below. The cabin weighs about 1450 pounds and is about 6′ x 10′. Inside at the peak it’s about 6’6″ tall so you can stand up in it. Please ReShare this inspiring story using the social and email share buttons below. Thank you! And if you enjoyed this micro cabin story you’ll LOVE our Free Daily Tiny House Newsletter with even more! I think that is very well done. It is definitely not boring or dull. Now that is what I call ‘repurposing’ in an innovative way! I love this, but I’m with the others about seeing interior photos. Please update this article with inside photos. Thanks for sharing! Would love to see how he did this. I have a Starcraft Pop-Up and would love to do something like this with it. I like it! I had similar thoughts and made an ultra small cabin as well. Having something that tiny is not for everyone but I like it and it makes towing much easier. The work looks sloppy, especially with the foam insulation coming out from under the roof. Too bad there’s no inside to this tiny home. What IS it with the haters on this site recently? I am looking at YOU Liz!!!!! And the foam insulation BTW looks like it was while the cabin was under construction–I can’t see it in any of the on-the-road pics. FYI—when you use this stuff it does tend to come thru any opening—this is how you KNOW it has SEALED. Then you let it CURE and TRIM it. Let’s see YOUR build and then we will rip it to pices too! amongst other things… see where angry gets you, you miss your spelling mistakes… ha ha ha. At least that lightened my Saturday morning. Appears the “hater” police is still on the job, Paul :-), ripping alternate opinions to pices. I love this! The wood work is impressive, it’s not easy to get those seams clean with those shapes! Seeing this makes me wonder why more people don’t build their tiny houses on either de-shelled RVs or medium commercial trucks? Facades can be placed around the engine/cab area making it look like another room of the house or an attached shed when parked. I wonder what the legalities of converting an RV into a tiny house would be? Yyyiiippppeee!! Man, you are livin’ the dream ! What a labor of love! Hit the road with passion! Your two best friends, ha! do they get the cabin or tent? So fun that you got to design it off the pop-up and you’re all freedom hittin’ the road in style! What an adventure! And a bicycle! From Utah to wherever! Awesome! What an inspiration!! Thank you. i m interested in converting my pop up trailor to a regular camper and i came across your tiny cabin on wheels and would like to do the same thing. is it difficult? or relatively simple. Love the solar panels on the flip up window cover. I think it’s great what you accomplished. I would be interested in how you did the inside. Don’t listen to the haters. I always believed it’s because they are jealous that they can’t do it. Keep up the good work. no problem in creating this out of lining boards and form steel profiles, but it would come far over 850 kg and needs electrical breaks if and when it gets ever registered in Australia. Usually they also ask for structural expertise report and that would be expensive and a hard task to get. I really love some creations! Very impressive – how can I get a copy of plans, directions, outline of how to do this, drawings, etc? I wish there were some, but as this was Michael’s DIY build, I don’t think he has that available. I too would like to see some interior shots of this cute cabin. But speaking as a retired Realtor, you critics don’t know how difficult it is taking pictures of a really small room or enclosure. Try taking a few shots of your walk-in closet and see how they turn out. Maybe Michael (the author of the article and designer/builder of the cabin conversion) could get some hints from the local real estate agents in his area on taking interior shots! Kudos to you Michael on your project.